After attending Merlimau Pakatan Rakyat CNY Gathering, Tok Guru Nik Aziz Nik Mat reappeared last night to deliver speech. Pakatan rakyat had resolved that PAS will contest in the coming Merlimau by-election. Tok Guru Nik Aziz Nik Mat personally supervises the by-election campaign to enhance the possibility of victory. 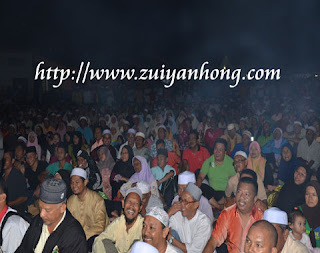 Large crowd flocked to Merlimau PAS Base at Jalan Batu Gajah on Saturday night (12/02/2011). As you can see from the above photo, the space in front of the stage was occupied by thousands of fans of Tok Guru Nik Aziz Nik Mat. They were joyful of listening to the splendid speech of Tok Guru Nik Aziz Nik Mat. 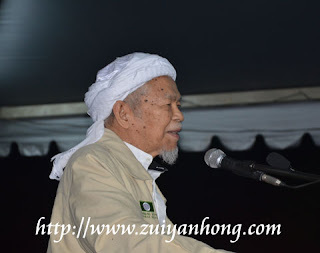 It shows that Tok Guru Nik Aziz Nik Mat is a respectful Islamic leader.